Once more, let's take a short trip to the land of Discworld spin-offs. I tend to have mixed feelings towards this ever increasing body of work. They rarely match novels proper in pure awesomeness, but to the die-hard Discworld fan (me!) they are welcome as something new from the beloved realm. Additionally, sometimes they are rather good. I really liked The Science of Discworld, or The Folklore of Discworld, I disliked Where Is My Cow? and The Compleat Ankh-Morpork City Guide is somewhere in between. First thing you need to know is that it comes with a map. Not the most beautiful map in the world, but an extremely detailed one, with every lane and alley properly named and located. As the sticker on the cover informed me, it is also available as an app, which may be of interest to some. The concept for the book is really interesting. A large part is presented as pages and pages of classifieds, those little ads which, abhorrent enough in the real world, are pretty tasty on the Discworld. They are a bit like 'How well do you know Terry Pratchett?' challenge: all the characters, places and businesses mentioned in the novels are there and it's up to you to recognise them. I did quite well, I think, although I bet I missed quite a few references anyway. But hey, no book of Terry Pratchett yields all its secrets if read only once. 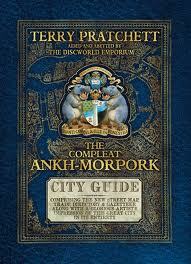 To tell you the truth, I think The Compleat Ankh-Morpork City Guide is a book for having, not for reading. Visually, it is absolutely stunning and would look fantastic on any shelf. I'm sure it's fun to keep in on hand to be opened on relevant page when reading any Discworld novel. As to the reading... Well, there is not that much of it, for one. It is not as funny as the usual Pratchett fare either. Still, speaking against Sir Terry Pratchett is a blasphemy. I shall shut up right now, or else my arm will fall off.